THE PITCH : Using 45-million-year-old yeast harvested from fossilized amber, Dr. Raul Cano, a Cal Poly microbiologist, brews beer. He’s used the same samples collected in 1996 to create the “pitch” used as a base in the brewing process. Dr. Raul Cano’s flip flops smacked on the concrete as he walked from his office in the Cal Poly north science building to his lab. A sign above the door read “Extant DNA Lab.” Inside, Cano walked to a dull metal incubator tucked in the far corner. He opened its doors and stuck his head inside, muttering to himself as he pawed through stacks of Petri dishes. “Well whadya’ know,” he said. He pulled out one Petri dish filled with translucent yellow gel specked with tiny gray globules of yeast mold growing in the incubator. He went to a freezer on the other side of the room and grabbed a box filled with about two dozen vials, each no larger than a thimble. “This is what we call the family jewels,” he said. Family jewels in this case means yeast extracted from fossilized amber. It’s 45 million years old. 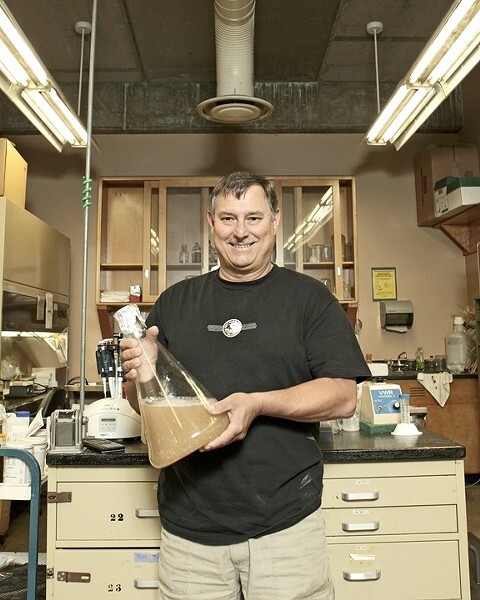 A little background: Cano has been teaching and researching microbiology at Cal Poly since 1974. In the mid ’80s while on sabbatical in Seville, Spain, he began asking himself questions. The answer is you can treat micro-organisms horribly and they’ll still be useful. Consider fossilized tree sap; amber. Cano and his colleagues successfully extracted bacteria from amber that had been literally frozen in time for tens of millions of years. From one sample, they isolated a few strains of 45-million-year-old yeast. Yeast has no clinical purposes, Cano said, but there are other more practical uses, and the next steps were almost predictable. Through a bit of serendipity Cano’s prehistoric yeast is alive, well, and being made into beer. The “family jewels” in Cano’s lab are the original samples, essentially the mother yeast he uses to grow for each new batch of beer. Cano pointed to a label on the box. It read “2/16/96,” the year he first pulled the yeast from its amber encasement. Using the original samples, he reproduces and grows the yeast in the incubator. In another corner of the lab Cano had a large beaker capped with a crumpled piece of aluminum foil and filled with a light golden liquid. He shook the beaker and flecks of yeast stirred from the bottom and swirled around like a snow globe. “And this is the pitch,” he said. Pitch is the base for beer brewing, he explained. Surprisingly, it smelled like beer. Cano doesn’t brew the beer, but he talks like a veteran brewmeister. “If you’re a microbiologist, brewing beer is just like growing microorganisms,” he said. In fact, Cano’s yeast sat in the lab freezer for more than a decade. It was Cano’s friend and now business partner, Chip Lambert, who began the transition from lab research to beverage. Lambert, a fellow microbiologist, is also a ski instructor. One of his students happened to be the wife of a prominent brewer. They formed a new company, grabbed some investors, and branded the beer Fossil Fuels. You can’t buy the beer yet. Kelley Bros. Brewing Company will likely start selling the beer toward the end of the year. Master brewer Joe Kelley said the idea of working with such an alien yeast continues to intrigue him. Cano is sometimes thought of as the guy behind Jurassic Park; the man who inspired Michael Crichton to write about bringing dinosaurs back to life using DNA from amber. Cano’s not that guy. He was researching the preservative qualities of amber at the time, but it was actually another company that inspired Crichton, Cano said. Jurassic Park film crews did shoot a scene at his lab in Cal Poly, but it was cut from the final picture. Still, there’s a framed movie poster in the office adjoining the lab. In fact, some of Cano’s research was inspired by Crichton’s story. He wanted to see if it could be done, if it’s possible to pull preserved DNA from fossils and build dinosaurs. It’s possible to extract DNA, Cano said, but putting together a dinosaur would be like assembling a 2-billion-piece puzzle in which all the pieces are the same shape. Cano still speaks with a slight Cuban lisp. He grew up in Havana, but his family left in 1961, two years after Fidel Castro came to power and the same year as the U.S.-led Bay of Pigs invasion. Cano began pursuing a bachelor’s degree with the intention of going into physical therapy. He changed his education path after meeting a fungal geneticist. From then on, Cano began a fascination with microorganisms. Staff Writer Colin Rigley does most of his yeast research in dive bars. He can be reached at crigley@newtimesslo.com.